In 1917, a businessman named Melvin Jones from Chicago founded the Lions Clubs. 100 years later, Lions Club International is the world largest service organization with over 1.4 million members in 200 countries. All of them have been united by one idea - We Serve. Lets celebrate the 100 years of service together, and continue to serve together. With the help from the community and all the participating partners, the Eyeglass Recycling Program@OYRHLC has collected more than 2,000 pairs of eyeglasses and lens in the lions year of 2016-2017. Your continuous support is greatly appreciated and needed for this on-going program. Please donate any reading glasses or sunglasses to the collection boxes located at our partner locations listed here. Your support help conserve sight for children and adults through out the world. It is the time again for the Spring Park Clean Up. OYRHLC has the park clean up at TooGood Pond Park, Unionville on Jun 18th the Fathers Day. It was a fun day to have our members and family to serve the community together and celebrate Fathers day the same time. OYRHLC has been sponsoring the St. John Ambulance Y1278 Richmond Hill Cadets Unit. It is an honor to present the Community Services Award to the top participating winner. It is a joyful day to support and celebrate with the youth in the community in the Cadet units 5th Anniversary Celebration. OYRHLC held the Pet Valu Walk for Dog Guides at Richmond Green Park on May 28th, 2017. Thanks to all the walkers, volunteers, lions and everyone supported the walk. With your kind support and donations, we are able to raise over $1,800 for the Lions Foundation of Canada dog guides service. Thank you! Twice a year, the Lions Foundation of Canada Dog Guides has the open house. The OYRHLC members and their families took this great opportunity to visit the dog guides at Oakville. It is a fun and educating day to learn so much more about the dog guide service programs first hand. We wish you can join us also in the next open house. OYRHLC participated in the Big Brothers Big Sisters of York A&B Courier Bowl for Kids Sake 2017. It was a fun evening to bowl with our friends and families, and raised fund for the BBBSY mentor program in our community. As of today, the Eyeglass Recycling Program@OYRHLC has collected more than 1,500 pairs of eyeglasses and lens. Thanks to all the donors and participating partners have been supporting this program. This is an on-going program that needs your continuous support. If you have any eyeglasses available to be recycled, please send them to any one of the collection box located at our partner locations listed here. Your dated eyeglasses will be able to keep on serving someone in need. Once again, thanks for your support! OYRHLC participated in the York Region Police International Day for the Elimination of Racial Discrimination. It was a great day to meet and learn from other community organization in York Region. Through out the winter, the Lions from OYRHLC has collected over 130lb of food for the winter food drive. The food are donated to 105 Gibson Centre Food Bank in Markham on March 11, 2017. Thanks to all the Lions and friends supported the food drive and help fight hunger in our community. 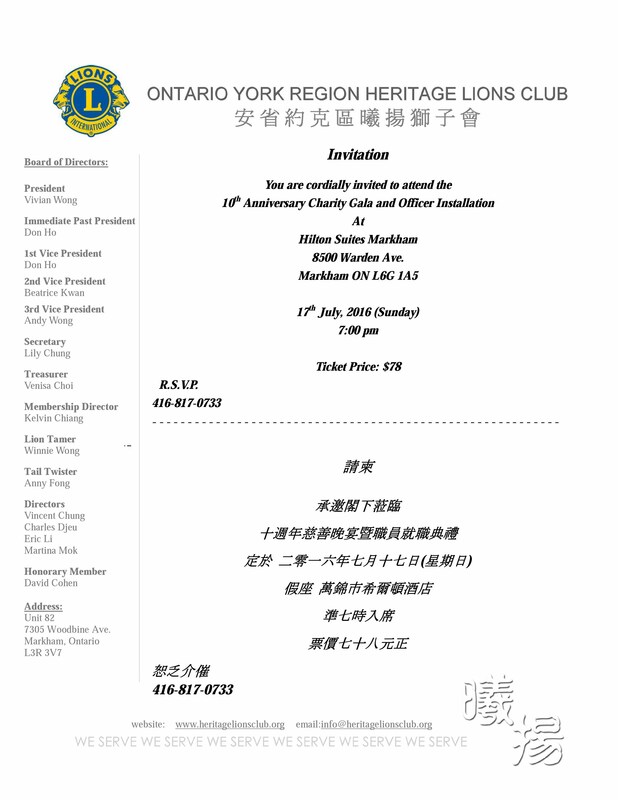 Ontario York Region Heritage Lions Club held the 10th Annual Effective Speaking Contest at Markham Civic Center's Council Chamber on March 5th, 2017. With 19 contestants competed in 3 divisions, it was a great day we see the youth in our community showcasing their communication skills and eagerness on social engagement. Once again, congratulations to all the winners, and thanks to all the participants, parents, judges, sponsors, volunteers and lions helped making it happen! Thank you for everyone who participated in making our gala a tremendous success! We look forward to seeing everyone again in our next upcoming events! Please follow the attached link for photos of the gala. Please join us in celebrating our club's 10th year anniversary to meet and mingle with new faces and a night of great food, fun, and laughter.